Ever wanted to know how to make a DIY slime recipe with your kids? Gooey, FUN, slippery slime. Kids are fascinated with it and I’ve heard that some mothers are too. The first time we made a batch, it ate the finish off my dining room table. That formula is not included here. There are many different recipes to try; some last for months and others are a one-time play activity. Kids of all ages enjoy creating the different textures. In this roundup of 39 recipes, you’ll find edible slime, glow-in-the-dark slime, fluffy slime and magnetic slime. There are slime recipes for a night sky, ocean swirl or star shine. Find snow slime, rainbow slime, and two ingredient slime. Make glitter, sparkle, or polka dot slime. Some use borax but some are borax free. Call it science, call it a sensory experience, call it a kid’s party activity — any way you look at it, you can call it fun. This Easy Dinosaur Craft is a perfect way to keep little ones busy. Color outside the lines with this Kid’s Truck Painting idea. If you’re looking to DIY your own slime, this recipe provides a classic ingredients list and instructions. You can even kick things up a notch by using glitter glue, instead of plain glue. While there are many ways to make slime, this Star Wars space slime take things to a whole new dimension. This recipe uses the basic slime recipe, but incorporates black gel food coloring and gold glitter to give it that galaxy like feel. Let the kids break out their Star Wars characters and experience the fun of sensory play! If you want a fun spring-summer twist on the classic slime recipe, try out this creative watermelon slime recipe! Instead of a bowl, you mix your slime in hollowed out watermelon! It gives a subtle watermelon smell to the slime and since a little pink juice from the watermelon rind combines with the glue and starch, you get a light pink tinted slime. You can add black beans into the mix for “seeds” or harvest the seeds of the actual watermelon to add back to your watermelon slime. 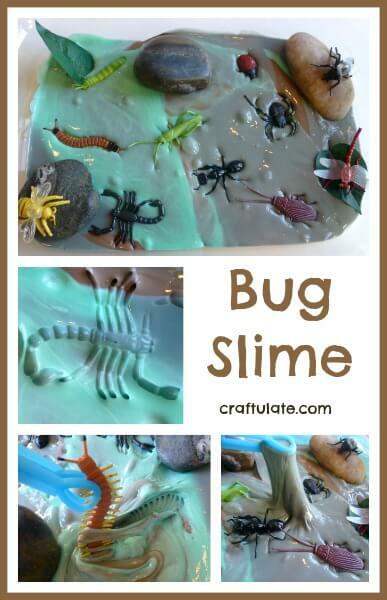 This sensory recipe for bug slime will provide hours of oozy, gooey fun! 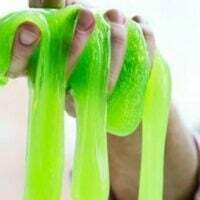 The slime is made from mixing white glue with liquid starch and food dye. Rocks, plastic leaves and bugs are added to the slime mixture for some bugged out fun! This chemical and Borax-free slime is edible! You’ll love the super easy, no-cook recipe that takes less than 5 minutes from start to finish! Wondering what the ingredients are? Cornstarch, basil seed, water and food coloring. 6. Oobleck: Liquid or Solid? In this fun hands-on science experiment, kids have to figure out whether Oobleck is a liquid or a solid. To conduct the experiment, you’ll need cornstarch, water, food coloring (optional) and a large bowl. Need a new sensory play activity for your little ones? This fluffy slime recipe may be a fun one to try! The interesting ingredient additions in this fluffy slime version are: shaving cream and googley eyes. 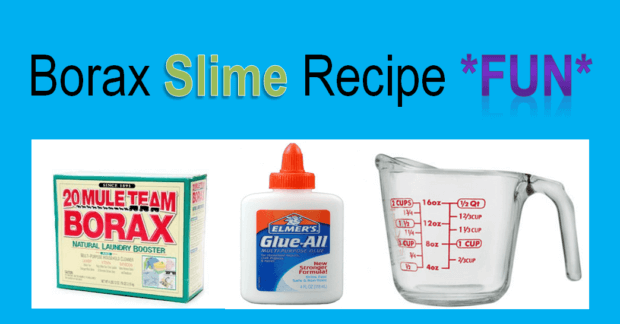 This Borax-free recipe for slime only requires two ingredients, and one of them is water! The other ingredient surprised us—Metamucil (a natural fiber supplement found at most grocery stores)! 9. Professor Figgy’s Glow Slime! Gross your kids out in the best way with Professor Figgy’s glow slime! It makes for a fun afternoon craft and/or science experiment and will keep your kids entertained for hours! This glow slime requires you to disassemble a fluorescent highlighter! A great boredom buster, you can make your own homemade play goo or slime using a recipe that features ingredients you might already have in your cupboards. Pull out the white glue, food coloring, measuring cups, Borax and some bowls for mixing and Ziploc baggies for slime storing. There are a lot of uses for Borax, including some fun, kid-friendly family science project ideas! One of the most popular Borax uses is definitely making slime! How fun would it be to DIY your own “monster boogers” for a Halloween party or any monster themed party? These monster boogers are just a classic slime recipe using Borax, water and glue, but add in a classic monster green color via food coloring. When we say simple LEGO slime, we mean simple! This slime recipe uses a basic slime formula and adds the tiny LEGO pieces to it—tiny dots, flat circles, and LEGO heads. While this is great for older kids, it is not recommended for children who still put things in their mouths. The secret ingredient in this glow in the dark slime recipe is glow in the dark paint! Using a neon food coloring gives this slime a really cool color too! Kids are fascinated by the colors of the rainbow! Adults are too! This rainbow slime recipe is easy and just calls for making a big batch of plain colored slime, dividing it into smaller batches and hand mixing in each separate color of the rainbow. Kids can play with individual colors or mix all of the colors of the rainbow together. Making sparkle slime vs. traditional slime is probably easier than you think! Just substitute clear glue for white glue and add glitter! Get ready for some fun sparkle play! This golden glitter slime may just bring out the star in you! A good amount of gold glitter was added to a traditional glue and starch mixture to get the gold saturation seen here. If you want a delicious smelling slime that will stretch and stretch, this chocolate stretchy slime recipe is a winner! And when it turns into its liquid state, it looks just like melted chocolate! Keep in mind, this chocolate slime is not edible in any way, even though it looks and smells tempting because of the addition of cocoa powder. This night sky galaxy slime is out-of-this-world cool! Clear school glue, liquid watercolors (in a few night sky colors), liquid starch and fine glitter are the main ingredients used to create each different slime color. The look of the resulting swirled slime mixture is awesome! To achieve this gorgeous ocean swirl glitter slime, you’ll need to make 4 batches of slime in blue, turquoise, green, and silver. This recipe uses liquid water colors and fine glitter to match the various resulting slime colors. Ready for some star spangled fun? This star spangled slime would be so fun to make on the 4th of July and only requires 3 ingredients: clear school glue, liquid starch and star confetti! This snow slime recipe almost satisfies that anticipation for the first snow! This recipe calls for chilled white school glue (or substitute silver glitter glue), to give it an icy, cold feel to mimic snow. The addition of iridescent glitter is a fun touch! If you want to get really creative, add a touch of peppermint extract to give it a minty winter scent! Throw in some pom pom balls into your slime mixture to create polka dot slime! 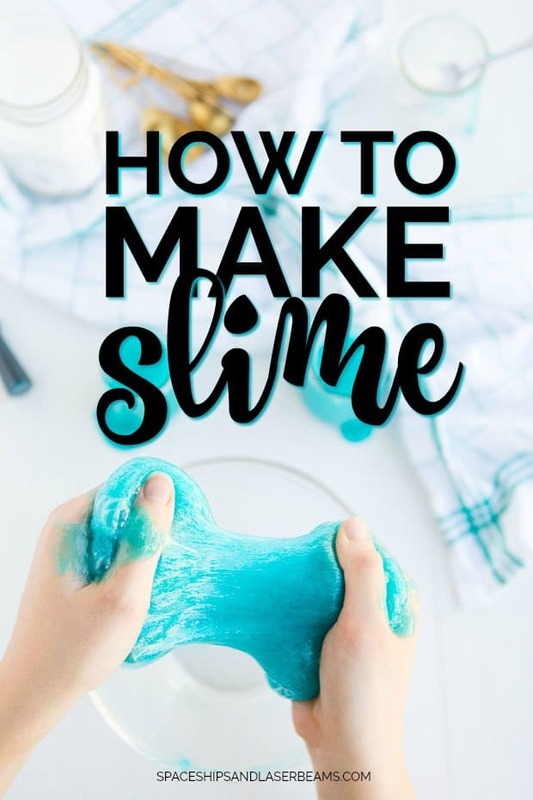 This slime recipe features clear school glue and liquid starch and results in a very stretchy slime that is so fun for playing! Up the cool factor of slime by making it glow! This glowing rainbow slime features fluorescent paint in each of the rainbow colors. You’ll just whip up a big batch of plain slime and divide it into 6 blobs before adding one rainbow color at a time to each of the 6 blobs. You’ll need a black light with this recipe to show off the glow! 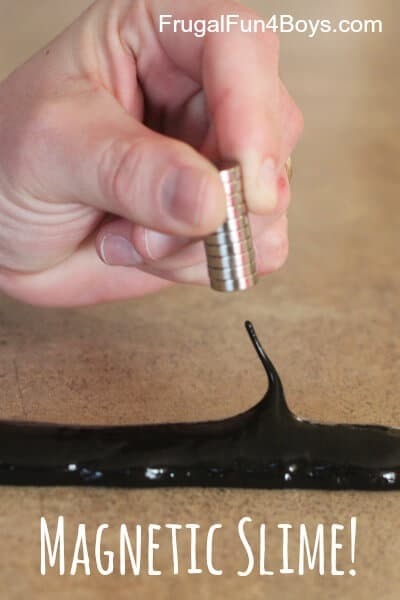 If you didn’t know you could make magnetic slime, you do now! Adding iron powder is the secret trick! If you thought playing with slime was fun before, you’ll love the fun of magnetic slime even more! If you’re afraid your kids might sneak a taste of their slime, we’ve got an edible slime recipe featuring Kool-Aid that is Borax and school glue free! This recipe features Kool-Aid for color and Metamucil (a fiber supplement). 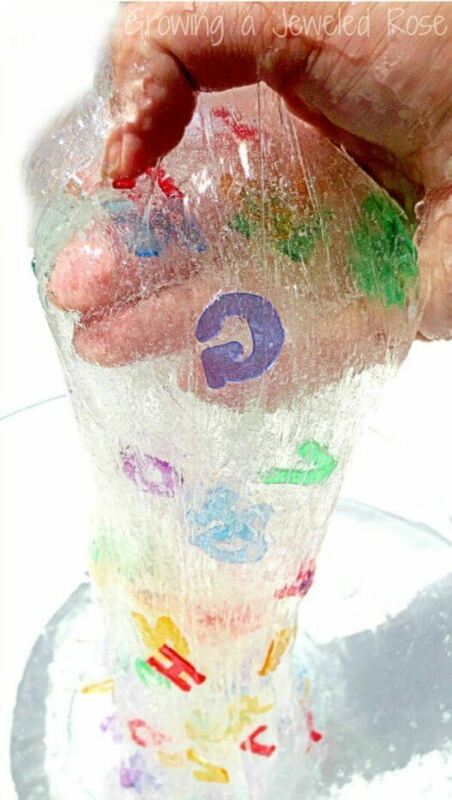 Not only will kids love playing with this ooey, gooey slime, but they can practice letter recognition by utilizing the “Eye Spy” game component. That’s right, alphabet letters are added to the slime, and kids must hunt for them! This fun sensory recipe for princess snot slime calls for unflavored gelatin and corn syrup. Additionally, food coloring, glitter and fragrances are added for a multi-sensory experience. This creepy soap slime is perfect for Halloween! 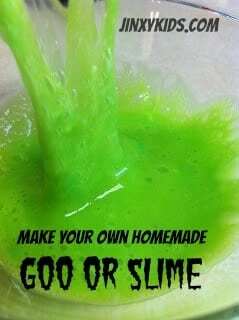 The recipe is a little more involved than other slime recipes as it uses powdered gelatin that must be dissolved in boiling water. 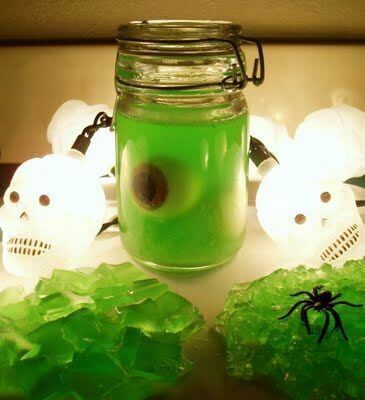 Other ingredients include: liquid soap, fragrance oil, table salt, liquid food coloring, spooky eyeballs and/or other creepy objects, glass jar for storage. Can you think of a better Teenage Mutant Ninja Turtle party favor than TMNT sewer slime? While this recipe incorporates the typical slime materials (Borax, water, white glue, food coloring), the packaging is what makes this especially cool for a TMNT party! Individual sized lidded containers house the slime, and have TMNT Sewer Slime labels! 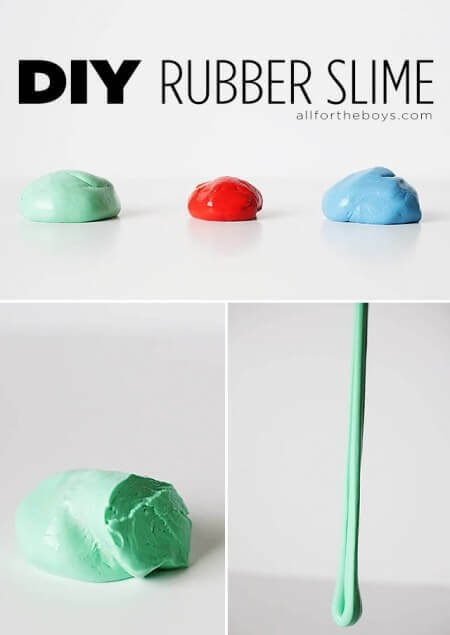 This DIY rubber slime recipe isn’t actually too slimy. It’s definitely a bit stretchy and a bit bouncy and is fun to make and play with by young and old. It utilizes many of the same ingredients as traditional slime recipes, but requires a stronger white glue than the typical white school glue. Now you can make your own radioactive canister of glowing slime, perfect for a Teenage Mutant Ninja Turtle party! This Ninja Turtle ooze slime is non-toxic and easy enough for a 3-year-old to make. Gather the following materials and follow the directions: clear school glue, green and yellow food coloring, Borax and water. Scented slime is a DIY multi-sensory playtime activity that kids will love! 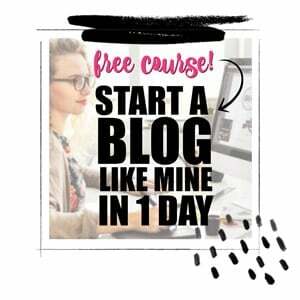 You’ll love how easy it is to make! 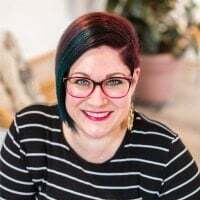 Like many slime recipes, it calls for liquid starch, clear school glue, colored glitter and Essential Oils or Extracts to create the great scent! A unique twist on traditional slime, this spaghetti slime uses a box of spaghetti, divided into three parts. Kool-Aid or food coloring is added to water and brought to a boil, after which one portion of the spaghetti is cooked and rinsed. This simple process is repeated using a different color of Kool-Aid or food coloring for each portion of spaghetti noodles until 3 different colors are achieved. This DIY floam starts with the basic slime ingredients: borax, white glue, food coloring and water! But, the addition of polystyrene beads makes this slime recipe even cooler! If you have lovers of Disney’s Frozen in your home, this Frozen inspired slime will be a favorite! To create the sparkly, oozy slime, you’ll need a bottle of chilled blue glitter glue and liquid starch! This recipe is so simple to make! Ooey and gooey, this silly pumpkin putty smells just like pumpkin pie. Ready to make it? You’ll need: white school glue, Borax, orange food coloring, pumpkin pie spice and warm water! Perfect for holiday play, this Grinch slime can add some excitement during winter break! To get the Grinch green, green glitter glue is used! Warm water is added to the mix. And a fun holiday scent was added with a few drops of Christmas essential oils! Mix water and baking soda together until completely dissolved. Add glue and mix until smooth. Stir in 2-3 drops of food coloring. Continue to add more until you get the color you want. Add saline solution and stir until it begins to pull away from the bowl and form a ball. Knead in your hands for a minute. If it seems too sticky, add a squirt of saline solution and continue to knead.